Now you can fight two stubborn skin concerns at the same time with the first patented time-release Anti-Aging Acne regimen clinically proven to reduce acne while diminishing fine lines and wrinkles. This high-performance solution includes an innovative anti-acne treatment technology that continues to work even after you rinse it off. Breakouts and wrinkles won't stand a chance! 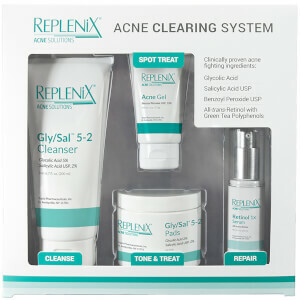 Encapsulated Salicylic Acid technology, provides a sustained release that continues to treat acne, even after rinsing. Amino acids and Hyaluronic Acid bind moisture to skin while antioxidants neutralize free radicals to preserve a more youthful appearance. Other Ingredients:Water (Aqua), Disodium Cocoamphodiacetate, Glycerin, Cetyl Alcohol, Cocamidopropyl Betaine, Cetearyl Alcohol, Sodium Cocoyl Isethionate, PEG-100 Stearate, Glyceryl Stearate, Butylene Glycol, Sodium Hyaluronate, Tocopheryl Acetate, Caprylic/Capric Triglyceride, Retinol, Salix Alba (Willow) Bark Extract, Ascorbic Acid, Chitosan, Silver Citrate, Sodium PCA, Betaine, Sorbitol, Glycine, Alanine, Proline, Serine, Threonine, Arginine, Lysine, Glutamic Acid, Zinc Gluconate, Argania Spinosa Kernel Extract, Serenoa Serrulata Fruit Extract, Sesamum Indicum (Sesame) Seed Extract, Cimicifuga Racemosa Root Extract, Melaleuca Alternifolia (Tea Tree) Leaf Oil, Cocamidopropyl Dimethylamine, Zea Mays (Corn) Starch, Hydrolyzed Corn Starch, Hydrolyzed Corn Starch Octenylsuccinate, Citric Acid, Disodium EDTA, Propyl Gallate, Polysorbate 80, Menthol, Cetearyl Glucoside, Glycol Distearate, Steareth-4, PEG-150 Distearate, Hydroxyethylcellulose, Polyacrylate-13, Polyisobutene, Polysorbate 20, Trisodium Ethylenediamine Disuccinate, Phenoxyethanol, Caprylyl Glycol, Chlorphenesin, Fragrance (Parfum). works great for clearing adult acne! I really like this product. I was discouraged after trying another cleanser to correct large pores.My face became very very dry and was peeling after using most of the cleanser.As I still had breakouts, I switched to Murad.It has cleared up my acne and my skin is much better. I like murad acne gel. It works well to clear up blemishes. So far all is clear! I have used Dr Murad's Clarifying Cleanser with excellent results (repeat purchases) and wanted to give this a try. You won't be disappointed. I used it at night (and switch between Clarifying Cleanser and AHA/BHA Exfoliating Cleanser in the shower in the morning). Like I said - excellent results!! I have combination skin, oily through the T zone and dry on my cheeks. I also have very sensitive skin, AND my skin is prone to breakouts along my chin... ummm, ya, I've got issues. Anyway, I am always looking for a better cleanser that caters to all of these issues and I found one! This Murad product is sooo good, I have had so few blemishes since I started using this. Even my facialist asked what I had changed because she could see the difference. Highly reccomend. Recently, my skin started to break out for no reason. I only ever used the acne spot treatment from Murad, but it was not getting it done. I purchased this cleanser and within 2 days my skin cleared up. Hooray! I've been using the Murad Clarifying cleanser and was running low so I decided to try the new Time Released cleanser. I'm 30 yrs old but my skin is having problems from hormonal issues. This one works so much better for me! The consistency is like a cream , not runny like lotion, and it doesn't foam up at all. Despite this, it doesn't leave a film, your skin will come out feeling refreshed, clean, and not tight. I feel like I need to use a little more than the other clarifying cleanser only because it doesn't foam up but I will still continue to purchase as I feel this is a good addition to their acne products line.